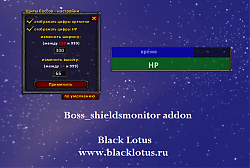 This is a little mod that monitor shields (how much they absorb) on ALL Cata boss encounters, where you have to bring them down. Also supports "Searing Plasma" debuff on Spine of Deathwing. Also can show this info in your GRID if you use modification version of GridStatusShield (you can find it on http://phoenixstyle.com site + need to set it in grid options). Youtube video example: watch it! Found bug? Have some suggestions? Post on a addon's forum! Video is crashed for german useres because it with "Content of UMG"